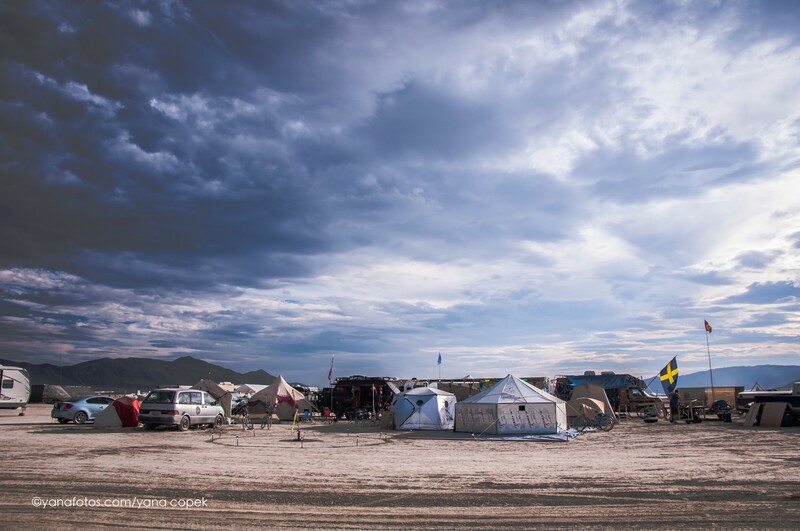 Each year, a tent pole metropolis arises from an ancient, typically lifeless lake bed. 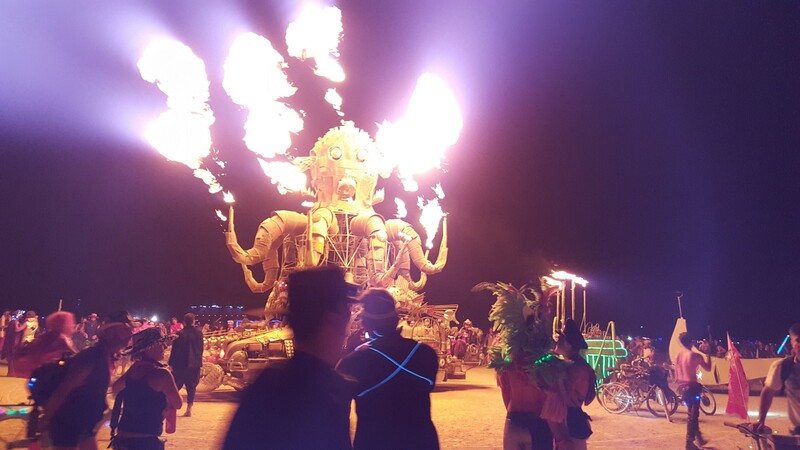 Black Rock City (BRC) has the trappings of any normal municipality: hospitals, roads, bars, clubs, an airport, a bank, a firetruck, a temple, suburbs, DMV (Department of Mutant Vehicles), ATM (Automated Taco Machine), thunderdome, space canteen, cuddle puddle, giant wooden effigy. You know, normal city things. There are a few minor differences. None of these services accept any money. 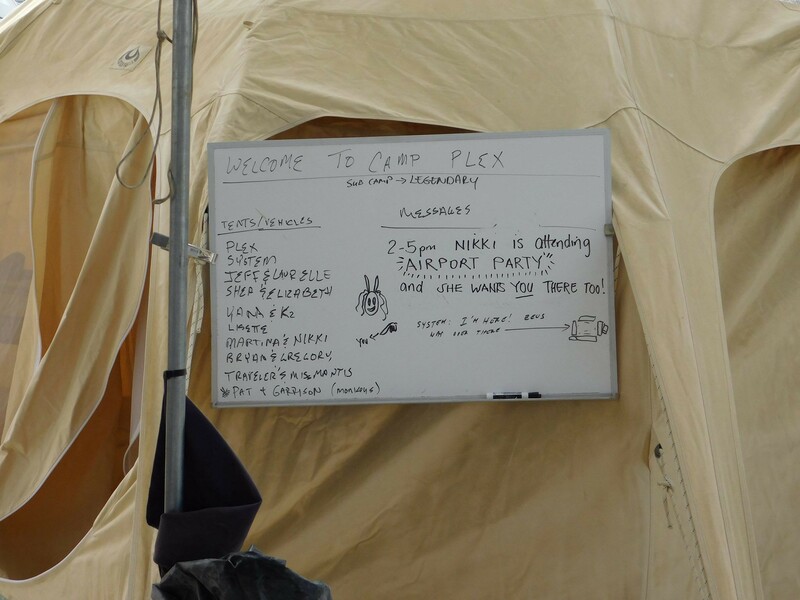 The main hospital is a dust-filled, military tent staffed by the most casual doctors I’ve ever met (who nonetheless, provide excellent medical care). The airport is a few lines of traffic cones, and both air traffic control and pilots refer to their passengers as “dirty hippies” (mind you, the pilots and air traffic controllers are also dirty hippies). Border patrol agents may be wearing neon spandex and top hats. Clubs don’t require that you dress up, or dress at all. The bank serves liquor and gives you a free account with 100 Black Rocks already deposited. Oh, and the firetruck shoots fire. Black Rock City is an alternate reality that snuck into this one. Within a month, the city is dismantled, the art is burned, and 70,000 people return to the “Default World” covered in dust, smelling a little funky, and looking as though they experienced divine revelation. The desert returns to its lifeless state until the construction begins again for the next year. Burning Man is a festival that takes place annually in Nevada’s Black Rock Desert. It’s also an experimental temporary society that stands in stark contrast to the one we typically occupy. Its attendees hail from all over the world and have been described by officials as “human locusts”. The New York Times called it “the Internet made flesh” in 2000, which I think is about as good a description as any. 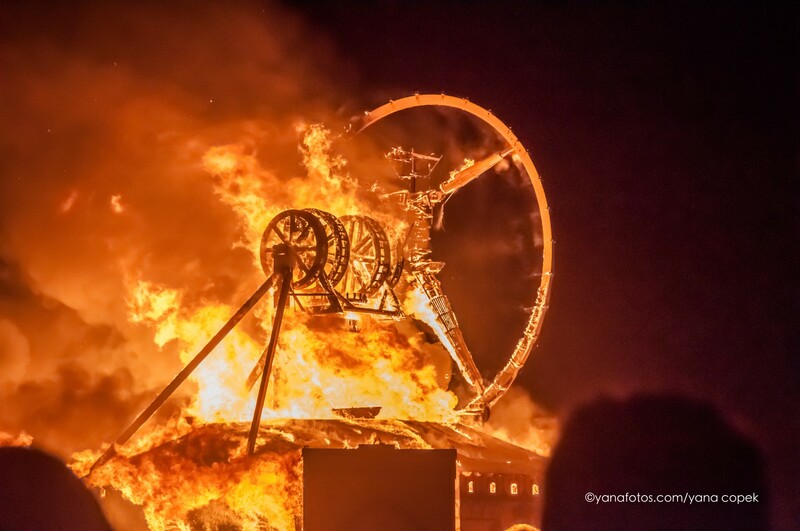 Elon Musk even claimed that Burning Man is Silicon Valley. Words cannot describe this experience, but I’m going to give it a shot. I also apologize in advance for what will seem like hyperbole, bragging, or stretched metaphors, but please trust that this is the only way I feel I can honestly communicate what I experienced. It is an event that cannot be contextualized. It is not Bonnaroo, even though live music abounds and positivity radiates. It is not an art festival, even though intricately designed art pieces are constructed (and burned) on the desert sands. It is not a hippie commune, even though it is filled with hippies and money is not accepted for anything beyond coffee and ice. 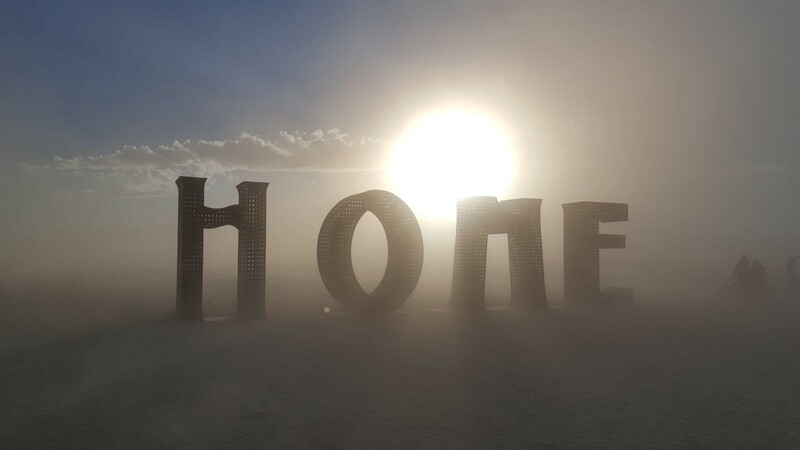 The best metaphor I heard was that Burning Man is like a kaleidoscope: you can describe what it’s like to look through one, but you can’t really understand it without seeing for yourself. Photos and videos do more than words to capture snippets of the insanity that surrounds you, but really don’t do it justice. Let me take a step back. 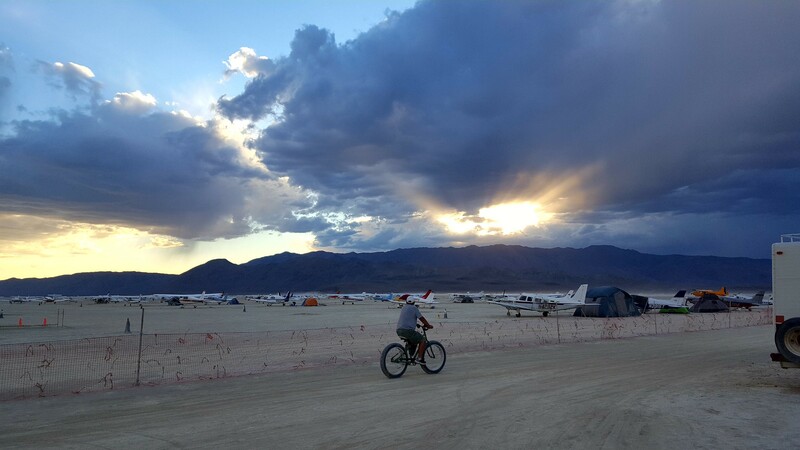 Getting to Black Rock City is an experience in itself. 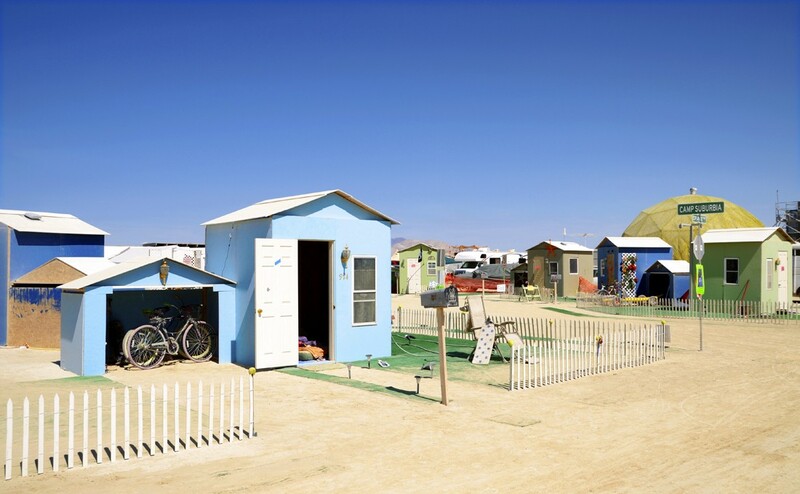 Perhaps the most famous of the event’s ten principles is “radical self-reliance.” The only things provided by the Burning Man Project are port-a-potties and medical services. The implication of this principle took a little while to dawn on me: I needed to somehow get a week’s worth of food and water, a shelter, (ridiculous) clothing for 40 degree temperature fluctuations, a shade structure, bicycle (BRC’s public transportation is a little lacking), enough LEDs and EL wire to glow in the dark, mask and goggles for the periodic dust storms, and assorted miscellany into the desert two hours from an actual city. Thankfully, I went with someone who had done this before. With the help of a Google spreadsheet, Wal-Mart, Hertz, and some problem-solving, we made it to the “Playa” (what everyone calls the desert) by mid-afternoon on Tuesday. The event starts at midnight on Saturday and ends with the burning of the Temple on the following Sunday night, so we were fashionably late. And with that, my Burning Man experience had begun. We planned to camp at the airport and made our way over at a brisk 5 MPH, any faster and we would kick up too much dust. We rolled up to the first guy we saw and asked about a good place to camp. Our new friend, Traveler, was a former military pilot and firefighter who flew hundreds of combat hours in Fallujah. He was also dressed like a pirate and may have been wearing a tutu (for Tutu Tuesday of course). He directed us to a good spot and we inadvertently joined CampPlex, a group of veteran Burners who manage to live luxuriously in the desert. It became very apparent that my friend and I looked quite out of place in our t-shirts, shorts, and sneakers. 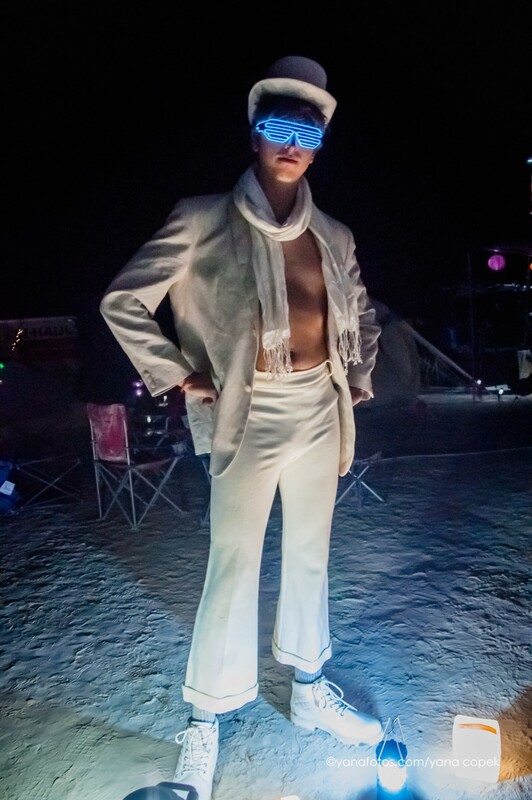 Burning Man is a place where the only strange outfit is a normal one. As we were meeting the neighbors, Plex himself thrust two tutus upon us for Tutu Tuesday. We did not hesitate. Another neighbor, Pusher, poured us two strong drinks from the extensive bar (with ice of course). When I told people that it was my first Burn, many of them said “welcome home.” I think this is the kind of thing they were talking about. Throughout the week, our adopted camp shared drinks and meals with us (homemade Greek and Italian meals made by actual Greeks and Italians in the desert? No problem!). A U-haul filled with fur, spandex, and sequins collected by some camp members was not only made available to us, but our outfits were personally crafted by our most fashion-conscious neighbors. We even made it onto the white board as “monkeys”: no small feat. We had stumbled onto more than a camp. We were welcomed into a family that happened to have its family reunions at the strangest place on earth. 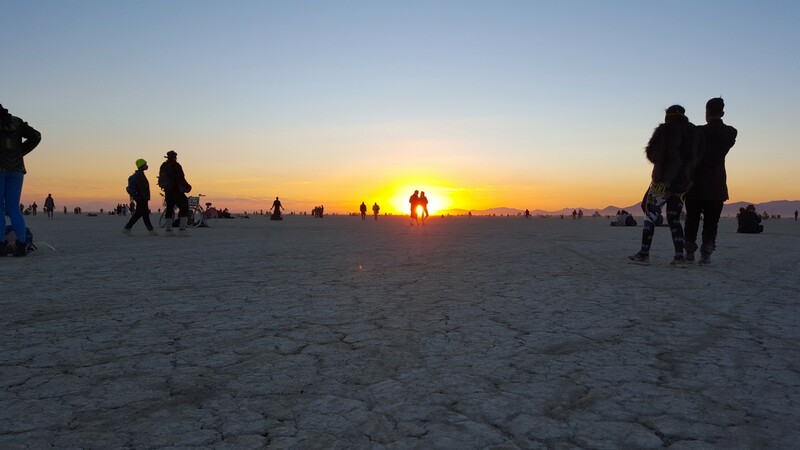 I stayed up until dawn three different nights and was about as active as anyone else I met at exploring the city and the Playa. Flipping through the 160 page schedule of events on the trip home made me realize I had seen maybe 5% of what was on offer. Part of me wishes I had done specific things: fight in the thunderdome, enter the Temple, attend more of the programming. But realistically, I did exactly what I wanted to do when I wanted to. 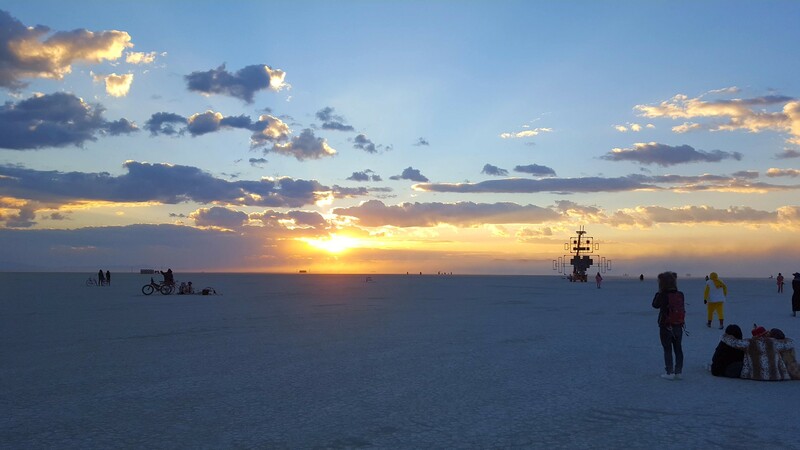 The beauty of it is that no one experiences all of Burning Man, but that’s part of the Burning Man experience. There are no press badges or VIP passes. The schedule of events is filled with conflicts that even Hermione with a timeturner would have trouble navigating. The only events that attract all attendees are the Man burning on Saturday night and the Temple burn on Sunday. 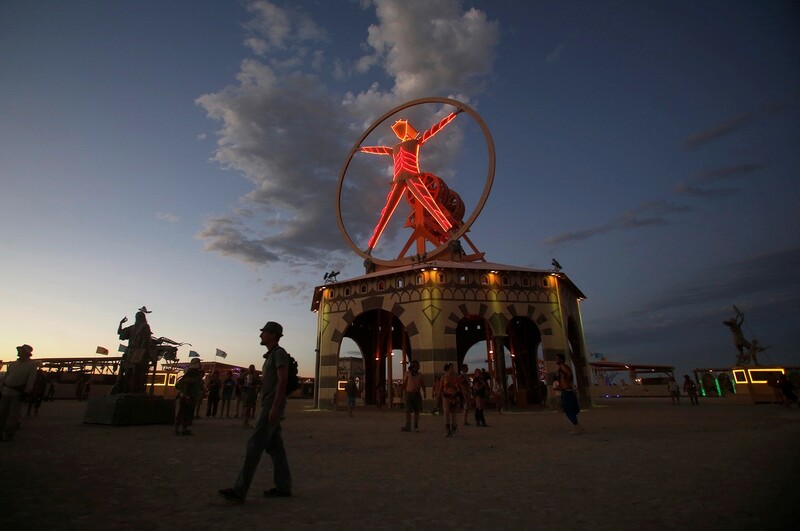 In the center of Black Rock City is the eponymous Man. The Man is surrounded by a small village of workshops including metalworkers, glass blowers, a notary, and a human hamster wheel. Around the village is sand dotted with art pieces. Generally, if it’s made of wood, it will burn, and if it’s made from steel, it will shoot fire. 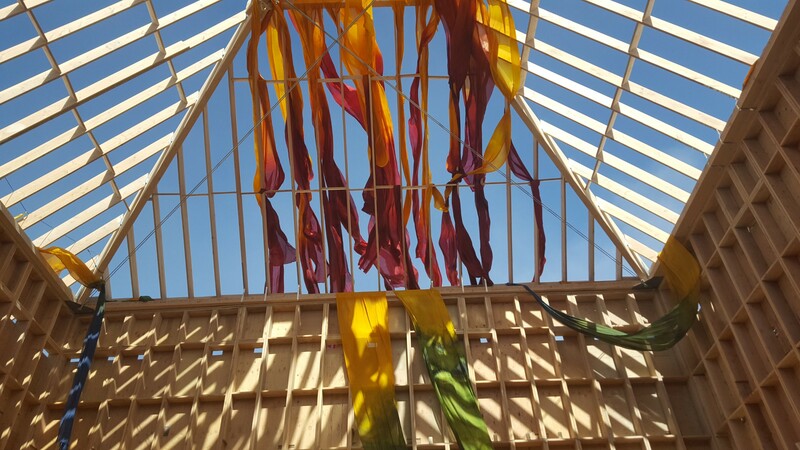 One of our camp mates described Burning Man as the greatest collection of passionate people in the world. While it’s impossible to test this claim, it certainly rang true to me. Perhaps the most incredible thing about the entire event is that (almost) no one gets paid to make it happen. The artists who create beautiful, elaborate, expensive, complex, and downright jaw-dropping art pieces often crowdsource funds and sink their own money into creating something that is probably going to be spectacularly burned in front of thousands of dirty hippies. The people who set up elaborate camps, some of which include legitimate buildings, multi-story structures, and massive geodesic domes are almost exclusively volunteers. 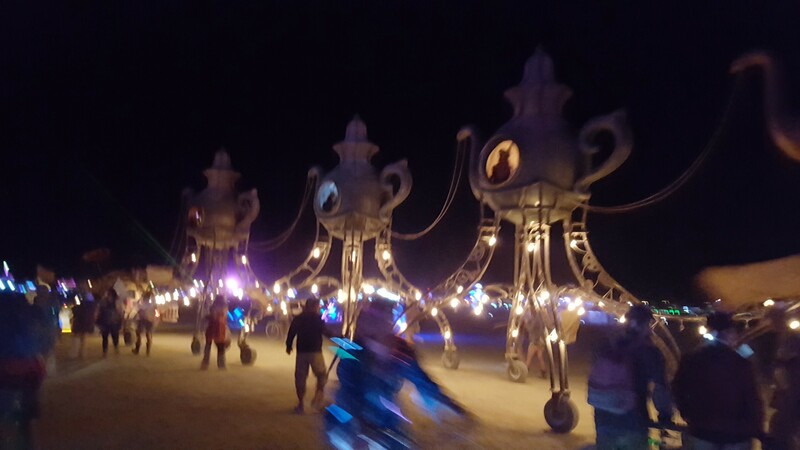 The art cars that make the Playa such a dynamic and fun place are also designed, built, and run by volunteers. 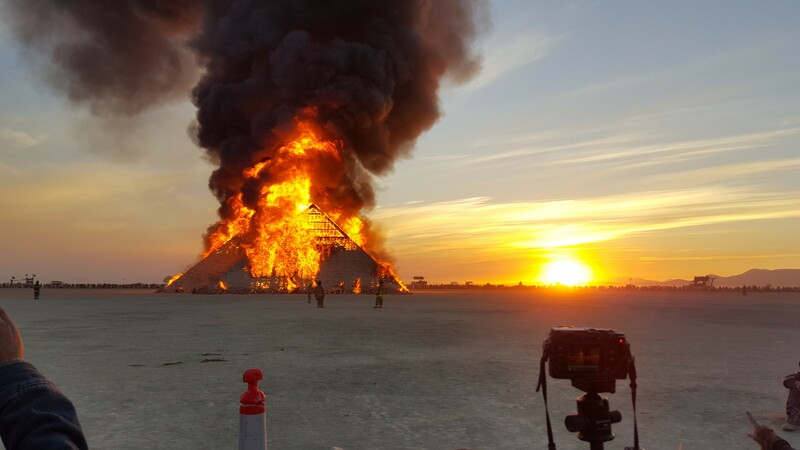 People accuse Burning Man of being a playground for the rich and privileged. While celebrities and billionaires attend (some of whom do so in not very radically self-reliant ways), I didn’t run into any (as far as I know). Most of the people I met worked in creative or physical jobs ranging from fashion, set construction, welding, and writing. 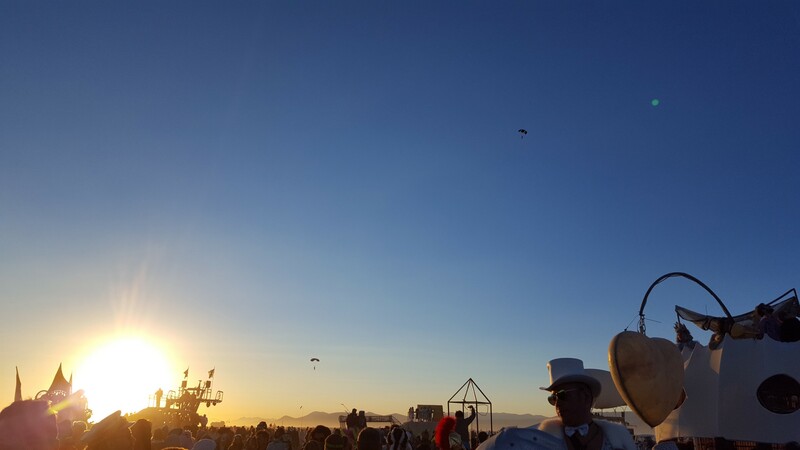 Attending is expensive, but a lot of people care enough about Burning Man to save money for it throughout the year. This is a truly incomparable experience, and I can think of few better ways to spend a vacation. In fact, the median Burner income is just over $50,000 and almost 90% of Burners made less than $150,000 per year, wealthier than the average American but by no means rich. Things like low-income tickets and tickets granted in exchange for volunteering make the event accessible even as the cost of attending goes up. Nearly 60% of Burners were men and 2/3 of respondents identified as strictly heterosexual (compared with 92% of Americans). The large LGBTQ presence was palpable throughout the event and made a lot of sense upon reflection. The gay and lesbian community has been shamefully excluded from mainstream America for most of our history. 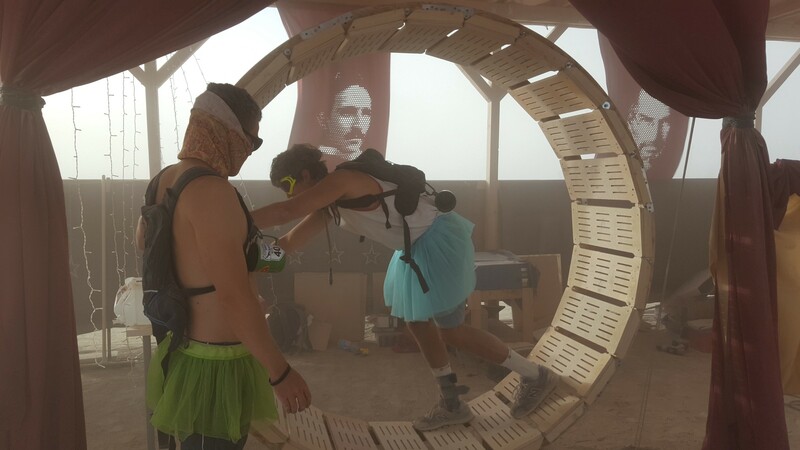 Events like Burning Man, built on principles like Radical Inclusion and Radical Self-expression, provide a safe space to be exactly who you want to be (or who you may think you want to be). Burners are also described (and decried) as radicals, hippies, beatniks, and counter-culture weirdos. This characterization is more accurate. According to the annual census, 41% of Burners chose not to affiliate with a political party in 2015, and 42% identified as Democrats. It turns out most Republicans aren’t as open to the Burning Man experience as Grover Norquist. The only remotely political thing I saw was a camp that had dartboards with the faces of prominent financiers like Lloyd Blankfein and Jamie Diamond. 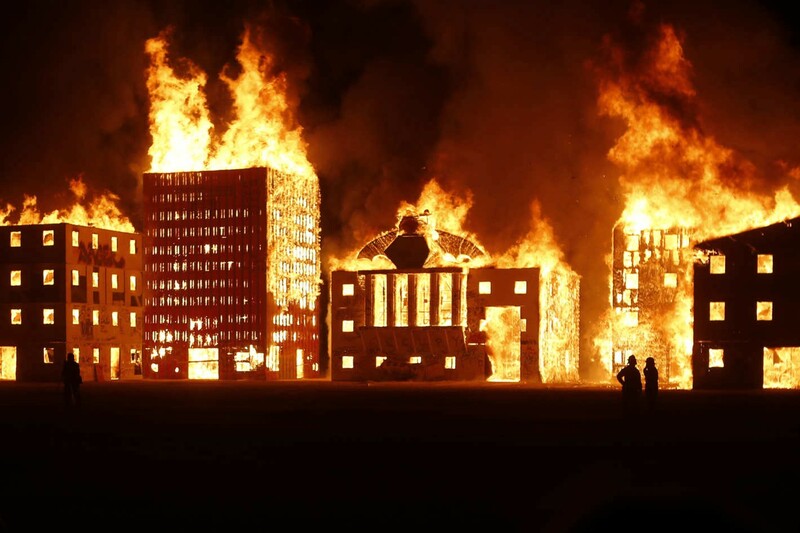 Oh, and in 2012, Wall Street was reconstructed and burned on the Playa. Instead of talking politics, I think most people took the lack of cell service as a blessed respite from a horribly depressing election cycle and preferred to focus on the beautiful idealism that characterizes the event. In another sense, Burning Man is a deeply political expression. 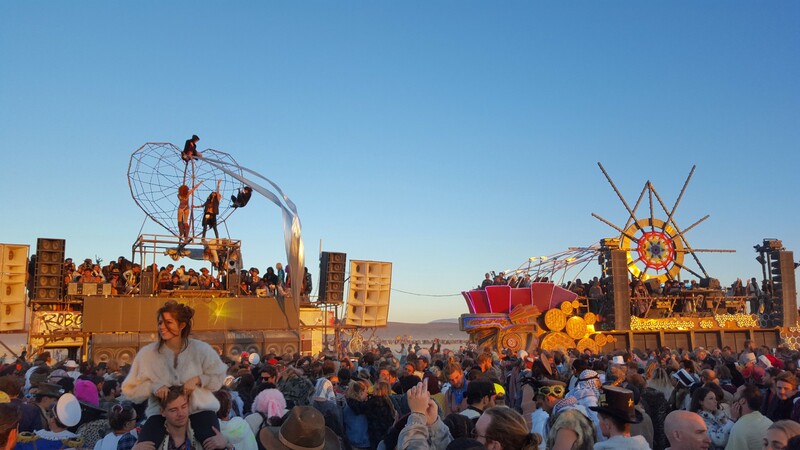 The norms governing social behavior on the Playa are a radical and conspicuous rejection of many mainstream American norms. Commodification is prohibited and commerce is replaced by gifting. Radical Self-expression is encouraged, even (especially?) if that self is not typically accepted in the Default World. Radical Inclusion means that you hang out with someone who, if you saw him on the streets, you would think is a homeless man from the future. Immediacy clashes with a culture that often is too focused on planning for the future to enjoy the present (I know I struggle with this). 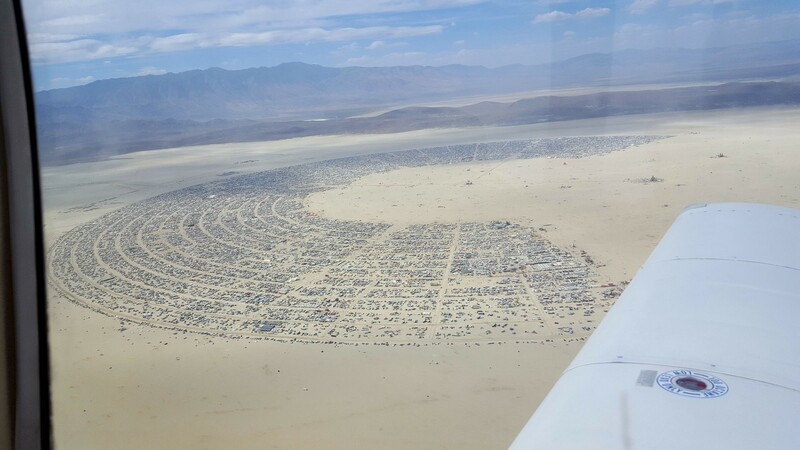 In a country flooded with cheap goods and plagued with unsustainable consumption habits, denizens of Black Rock City work hard to Leave No Trace and scour the sands for MOOP (matter out of place, i.e. garbage). In a time and place where the expansion of technology-enabled services has made us accustomed to an on-demand lifestyle, 70,000 people Radically Self-rely. Authority figures are virtually non-existent, and life was not solitary, poor, nasty, brutish, or short. And, of course, there are a lot of naked people. 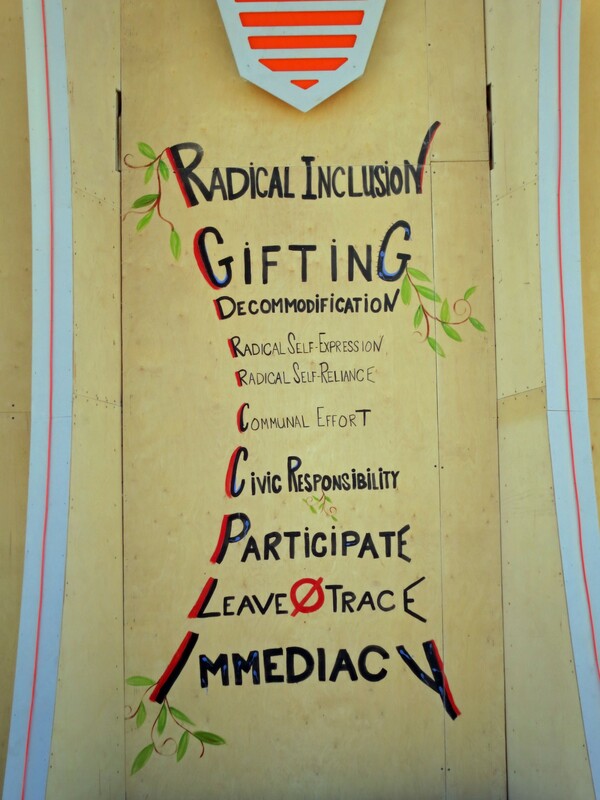 These principles are essential components of the Burning Man experience. They’re also aspirational, not binding. I’m not naive enough to think that we should make America Black Rock Nation. Burning Man could not take place without the society surrounding it. The quality of the water and food we bring, the roads we use to get there, and the safety to do it all is provided or assured by the government. Addressing climate change and creating sustainable consumption patterns will require far more than cleaning up after yourself. And Immediacy is important, but so are 401(k)s.
Nonetheless, I think some elements of Burning Man could integrate into our culture tomorrow to the benefit of all: we can expand our conception of “socially acceptable behavior”; we can impose a stricter standard for deciding what we prohibit people from doing; we can be better to each other. Every person you meet greets you with a hug. Sharing food and drink with total strangers is normal (I mentioned being hungry to a friend at the dawn burning of the Pyramids and a stranger offered some of her chicken tikka masala and didn’t mind that I ate with my hands). Nearly all social barriers and inhibitions are broken down and people still got along fine. In fact, it made me wish that socializing were like this all the time. Oh so it’s like a barter system? is a common question asked when the event’s lack of commerce is mentioned. The answer is: nope, I did not spend a single dime within the event and received amazing meals, drinks, clothing, handmade trinkets, and an airplane flight. There was no expectation of reciprocity; appreciation and human connection were the only things I needed to give in exchange for what I received. As we waited in line during Exodus, a man was handing out ice cream sandwiches (after a week in the desert). 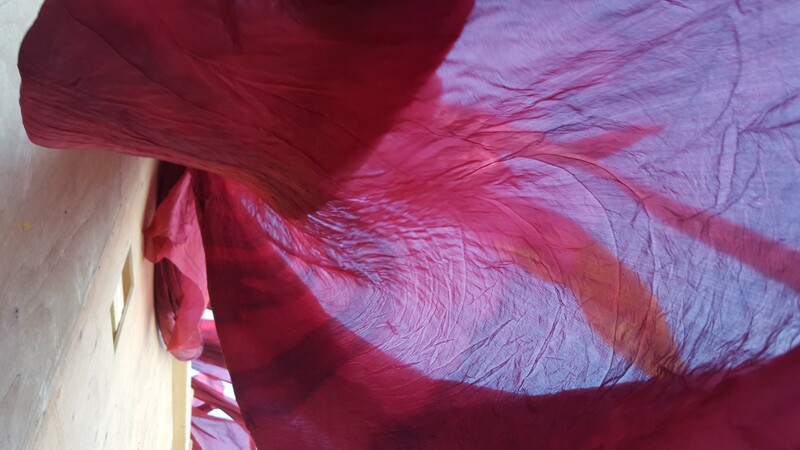 One camp, Kostume Kult, trucked in shipping containers of outfits from NYC. Any Burner could come pick out their costume for keeps on one condition: he or she gets announced and walks the runway in front of the camp. One of the art cars, a giant sandwich, gave out pieces of “sammiches” to anyone willing to sing, dance, or make a confession for them. One man got an entire sammich after singing English sailing shanties for a small but growing crowd. All that your ticket purchase guarantees you is entrance to the event, access to port-a-potties, and limited medical care. Everything else is on you or your camp. That means all food, water, supplies, and anything else you might need in a literal desert must be brought by you. Conditions are extreme in every way: temperatures can range from 100+ degrees in the day to low 40s at night. Humidity is zero (so bring lots of chapstick). Winds of 50+mph create dust storms known as white outs where visibility can be as low as 5 feet. These strike without warning and can last hours. About an hour before the burning of the man, our camp was about to leave for the center. Just then, a white out hit that forced us all under cover. Our tent was completely filled with dust as belongings outside began to fly away. I was thinking that surely the winds would let up for the burning of the man, then I realized that none of this is under anyone’s control, and there is no contingency plan. We ventured out anyway using Marco Polo to keep track of each other’s locations. Missing the burning of the man because of bad weather never crossed any of our minds. When I was flying with one of the pilots from the airport camp, another plane flew into our flight path. I was a little bit concerned, but remained confident that my pilot knew what he was doing. A few seconds after I spotted the other plane, my pilot said, “woah, where’d that guy come from? !” and quickly changed course. It wasn’t that my pilot was incompetent or absent-minded; we were flying a 50 year old plane on visuals alone. A few hours after the Man burned on Saturday, I returned to the site to see a group of about 20 people throwing huge pieces of wood onto the once-dying fire. As the flames grew high again, I realized there were no firefighters or any other authority figures present. I talked to one of the Burners. He and his camp were burning their art car, which had once been three stories of bleachers built on the back of a truck. The car carried a mobile audience and commentators whose subjects were passing Burners. All that remained was the cabin of the truck and some very warm observers. 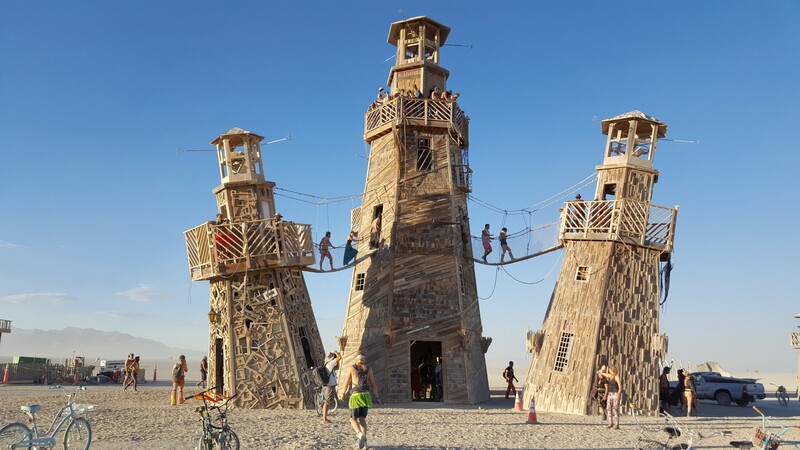 As I was dancing on the roof of an art car to Diplo, the floor started to crack, forcing us to climb down the ladder (which was really an unattached rope swing) to the safety of the Playa below. In all of these situations, I had to break away from my internalized trust in systems. Normally, this kind of trust is necessary to participate in everyday life. Constantly questioning the safety of your commercial flight or subway car is a waste of time: these activities are heavily regulated and your skepticism is not going to affect the likelihood of a catastrophic failure. At Burning Man however, almost nothing is regulated. Wariness is healthy and necessary at times. You and only you are responsible for your safety and well-being. 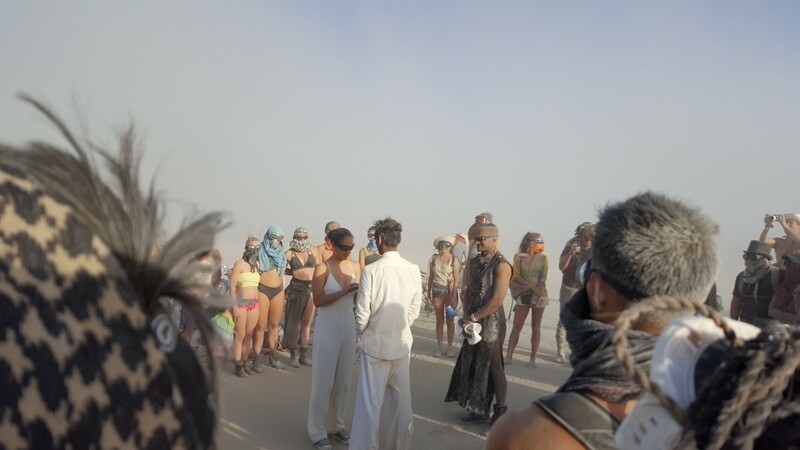 Coming from one of the most coddled and litigious places on earth (America) to Burning Man is like arriving on another planet that has really loose liability laws. 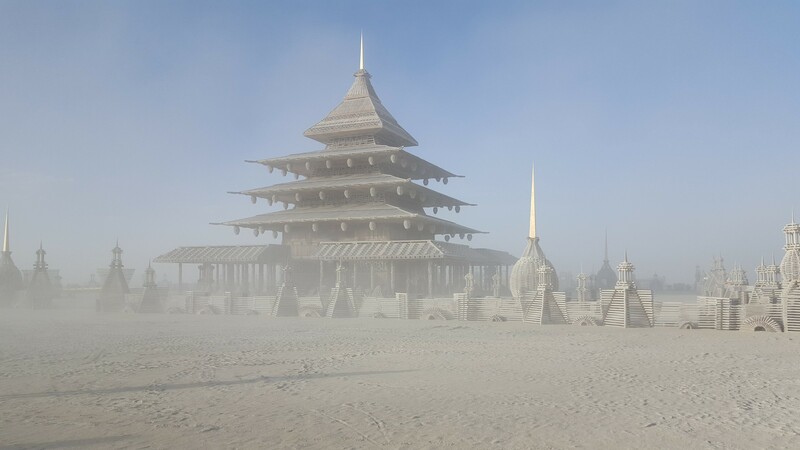 Past the man is the Temple, perhaps the most powerful part of Burning Man. 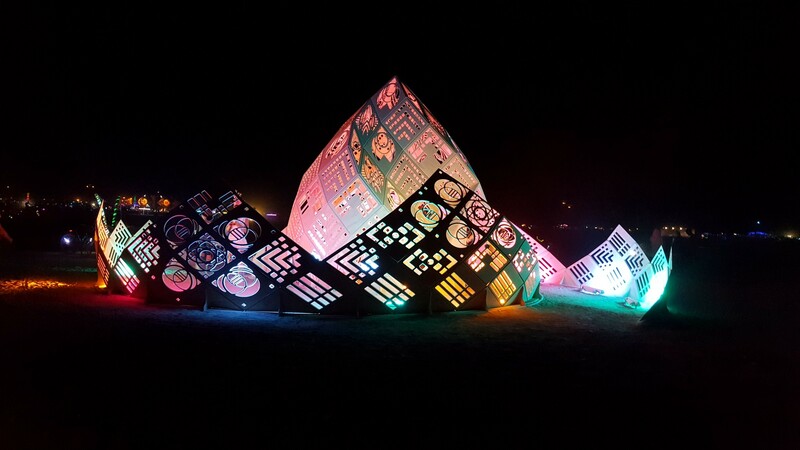 Along with the Man, the Temple is the only art piece that makes an annual appearance on the Playa. Burners enter the nondenominational structure to create small memorials and shrines, typically for loved ones who have passed. In a place where joyous revelry is the norm, the silent and somber atmosphere stands in stark contrast. While I did not get a chance to enter the Temple (we went before it opened and after it closed), just standing nearby was overwhelming. Men and women were crying as they penned silent messages to someone who is no longer with us. I wrote a note for my dog who had recently died. Even though the Temple was already closed in preparation for the burn, we were able to put our messages into a box where they would be taken inside. The burns are typically a festive occasion. As structures collapse and fireballs bloom, the crowd roars. But when the Temple burns, tens of thousands look on in silence. 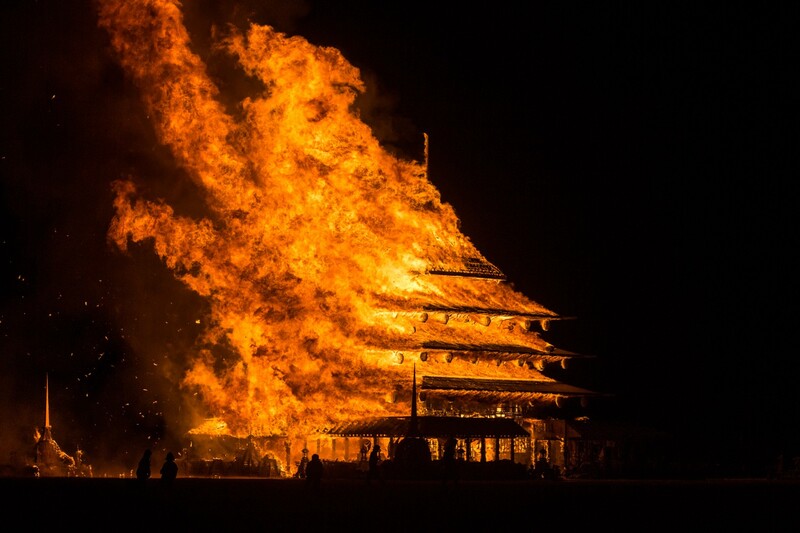 The power of the Temple also offers a sharp rebuttal to those who think that Burning Man is just a hedonistic playground in the desert. It is very easy to have a life-changing experience even without intending to. I certainly did. Interacting with so many friendly people from so many different backgrounds made me more open to meeting and befriending people far different from myself. Witnessing the incredible creativity, innovation, and effort put into each art piece, art car, camp, and experience has inspired me to further explore my creative side. Camping with pilots and getting to fly a plane has inspired me to pursue a pilots license. A wild Robot Heart appears! Ultimately, Burning Man is a celebration of beauty in all its varied forms. The event began in 1986 with 20 people burning a wooden effigy on a beach near San Francisco, and while much has changed, the event remains focused on sharing beautiful experiences together. The overwhelming power of the aesthetic is what draws 70,000 people to a desolate patch of desert. It’s what motivates thousands of artists and volunteers to create something beautiful only to see it burn. Some might see this work as purposeless. But most activities only have the purpose we choose to give them. Viewed through this lens, the purpose of an artist is staggering. Can you quantify the closure a woman receives after feeling that her message reaches a deceased loved one as the Temple burns? Or the affirmation of a suicidal man’s will to live upon experiencing a work of art that brings him to tears? 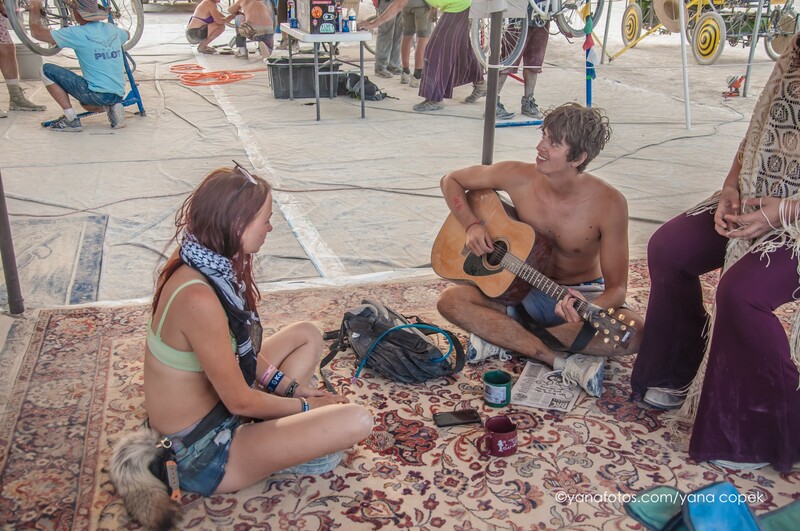 Or the wedding of a couple who met and fell in love among the art and beauty of the Playa? Soon all human work may be needless if not purposeless. Our world is rapidly changing. A future of automated work and material abundance may be inevitable, and I used to fear a time in which humans are made idle by forces far outside of their understanding.